For Hong Kong with just 1,100 square kilometres or 410 square miles and a growing population of 7 million, it was only a matter of time before land would extensively become reclaimed. 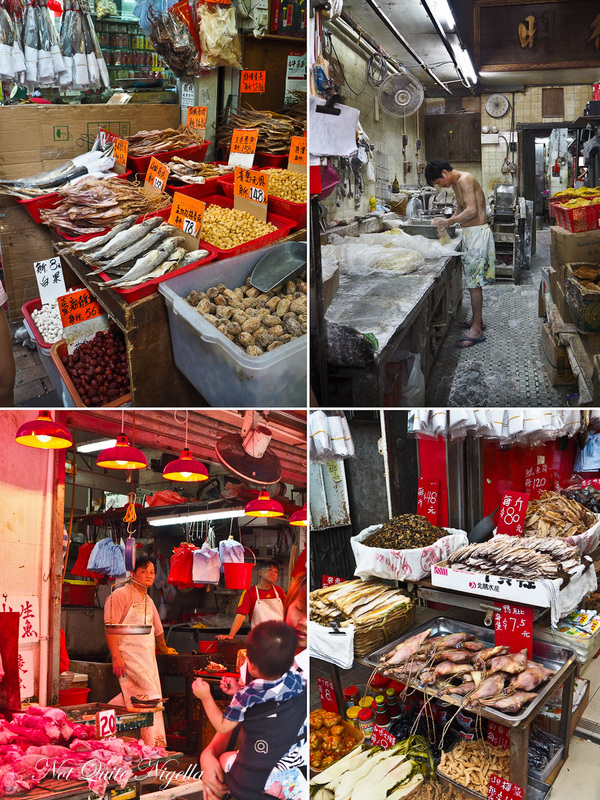 One need only spend a day in Hong Kong to see the frantic pace and the crowds that inhabit the small island. In the past century 4,000 hectares of land were reclaimed (Hong Kong is the country with the second most reclaimed land after The Netherlands). Sham Shui Po one of the most traditional areas in Hong Kong was originally called Deep Water Pier as it sat on the edge of the island. Now it is covered in land that extends down to Nam Cheong. 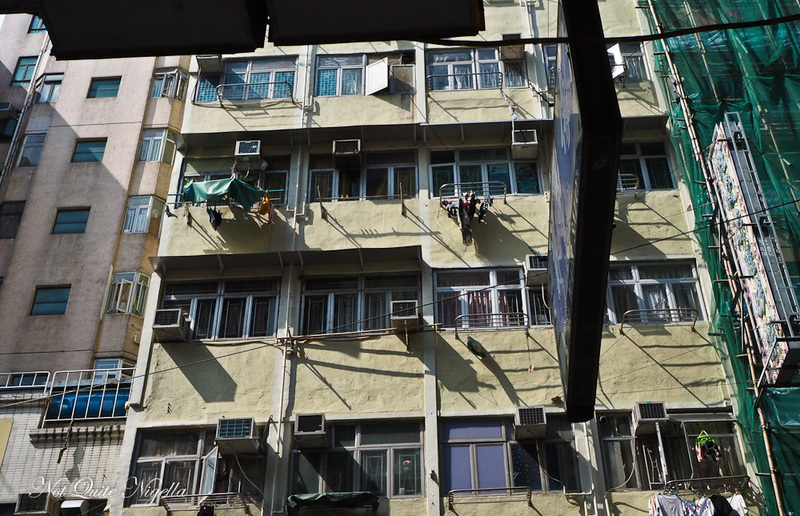 Space was such a premium at Sham Shui Po that in the early 1900's many single men lived in 6x3 foot cages. Some apartments had 20 cages in them and they allowed workers to live cheaply in a densely packed city. Some of these cages still remain although the government is attempting to abolish these. 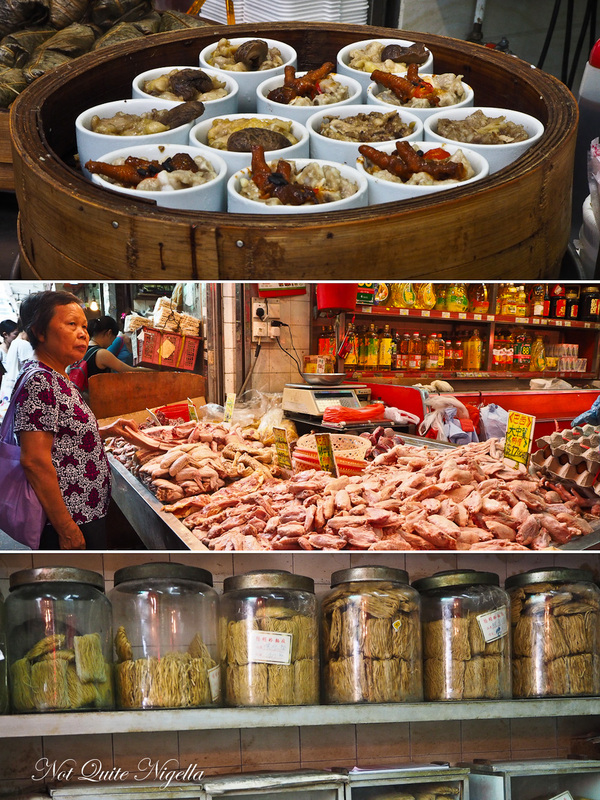 I am in Sham Sui Po on a Hong Kong Foodies tour, one of the most popular tours in Hong Kong. The tours combines a taste of six stops as well as fascinating cultural and historical information. 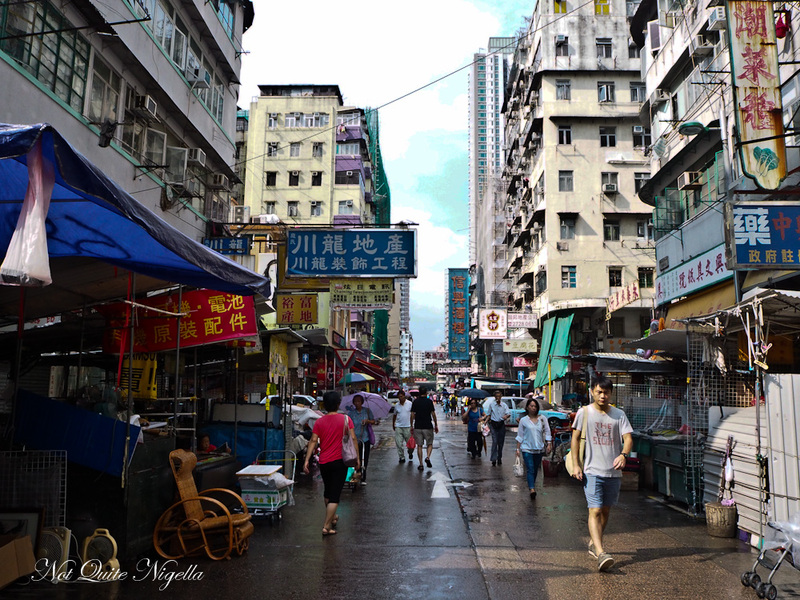 The Sham Shui Po tour starts at 9am and finishes at 1pm. There are just under ten of us on the tour headed by Silvana and Fiona. This particular tour is a popular one for a couple of reasons. The area is a low to middle class neighbourhood where little English is spoken in person or on menus. 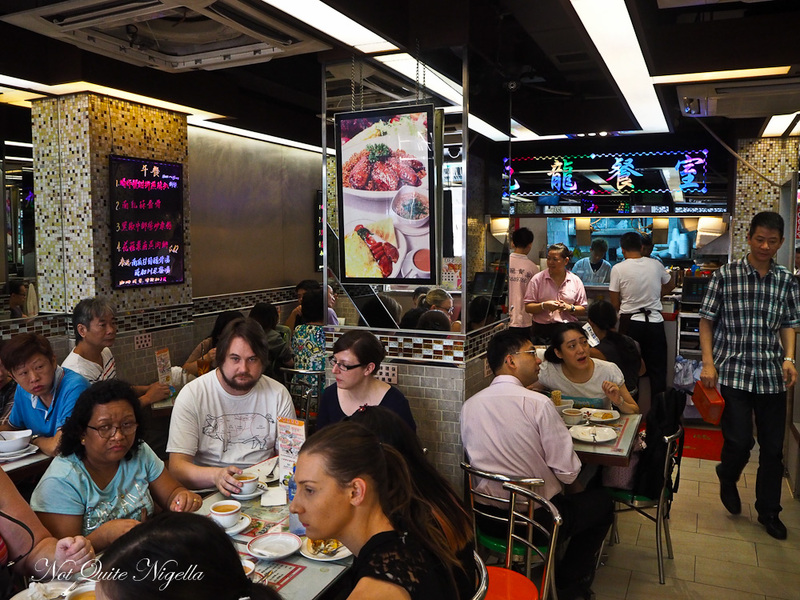 It is also one of the most popular places for people to eat on the weekend and allows locals a chance to indulge in nostalgia and to eat food that is less commonly found nowadays. Our first stop is at Kowloon Restaurant where we all take a seat and they slide across some enormous pineapple buns. The name of the bun is a slight misnomer, there is no pineapple in a pineapple bun but the topping, a crunchy sweet mix of egg and sugar once baked, is said to resemble a pineapple pattern. The buns here are particularly renowned as they are freshly baked every 15 minutes. 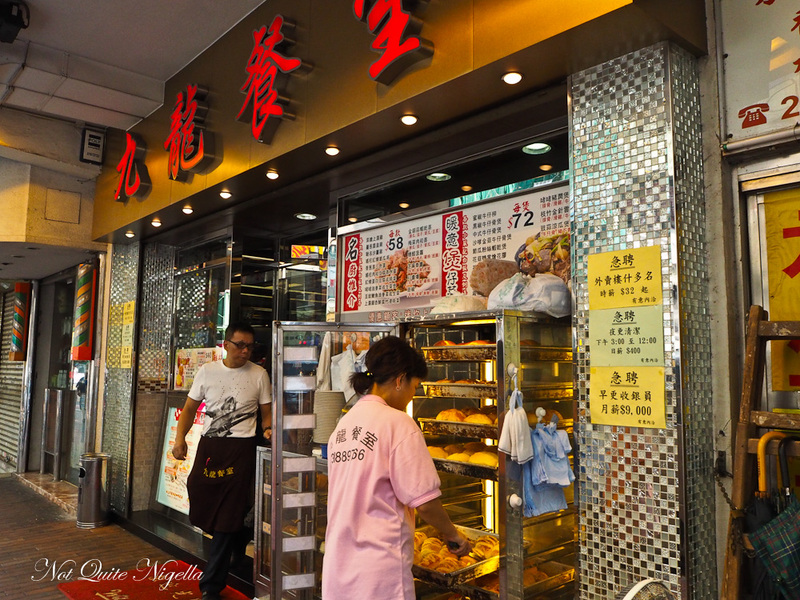 Mr Ching has been making the buns for 20 years and starts work at 1am. We watch him haul tray after tray out and bring them to the display outside - you can also buy these to go from the front of the store. They sell about 600 pineapple buns a day. You typically have these served split with a slice of butter on the inside - the hot bun melts the butter. 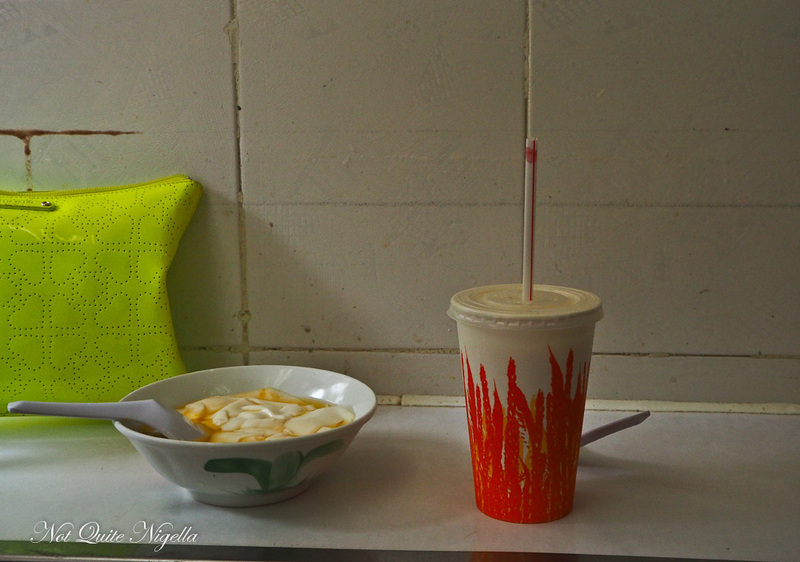 I watch as people around us slurp noodles and spoon scoops of macaroni soup for breakfast. 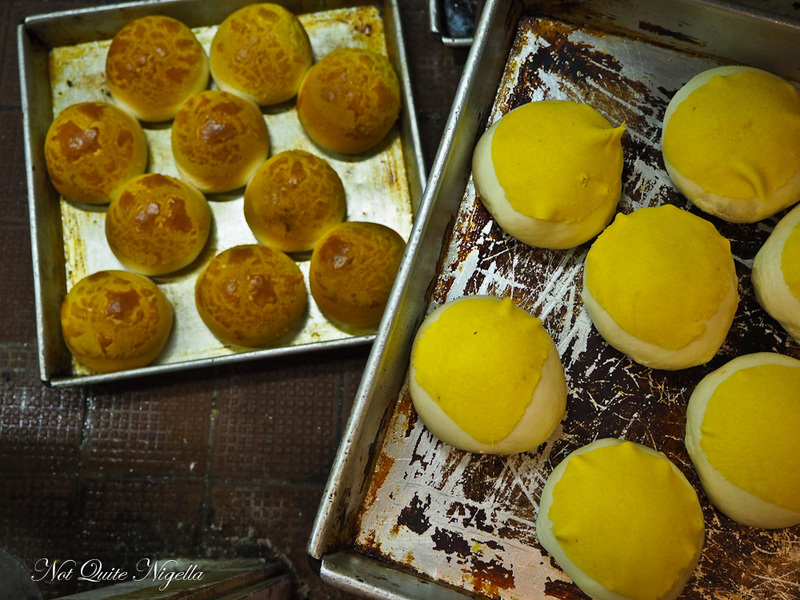 We wash the pineapple bun down with a Hong Kong Milk tea made with strong black tea and evaporated milk. Silvana explains that the menus in Hong Kong often reference other countries. There are Mexican buns sold here and these are devoid of anything particularly Mexican (they're filled with egg custard). The story goes that Swiss style chicken wings got their names from a misunderstanding. They heard people saying "Swiss sauce" when they actually mean "sweet soy sauce" which is what the chicken wings are sauteed in. 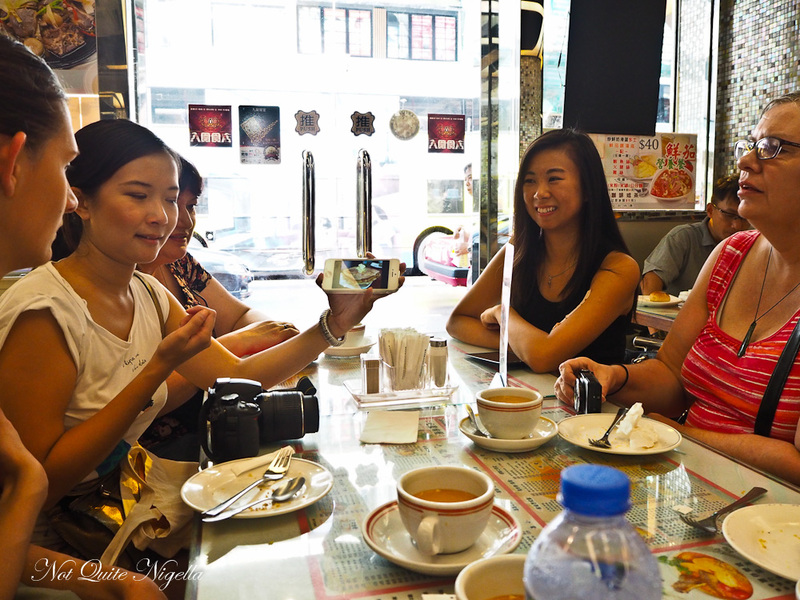 Our second stop is at Hop Yick Tai for a second breakfast. 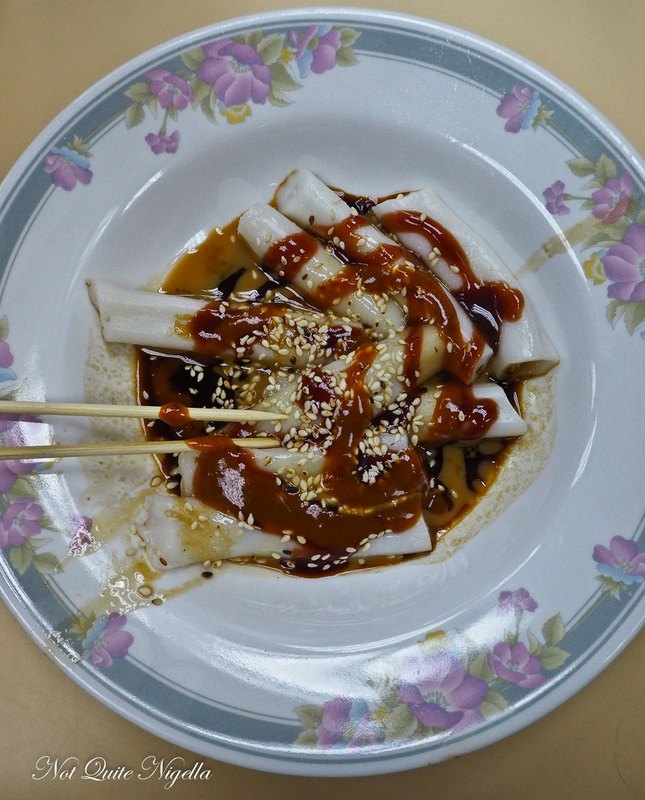 For the cost of 6HKD or $1AUD you can get four Ju Cheung Fan or rice rolls sliced up. It's then up to you how much hoi sin, chilli sauce or sesame seeds you want to add. Silvana explains that this item is a highly nostalgic item for many locals. It was often given to children as a special Sunday breakfast treat and they're not easily found any more. The key to a great rice roll is one that doesn't unravel or unroll when you're eating it. I watch a man spear three pieces with his skewers and eat them with relish. 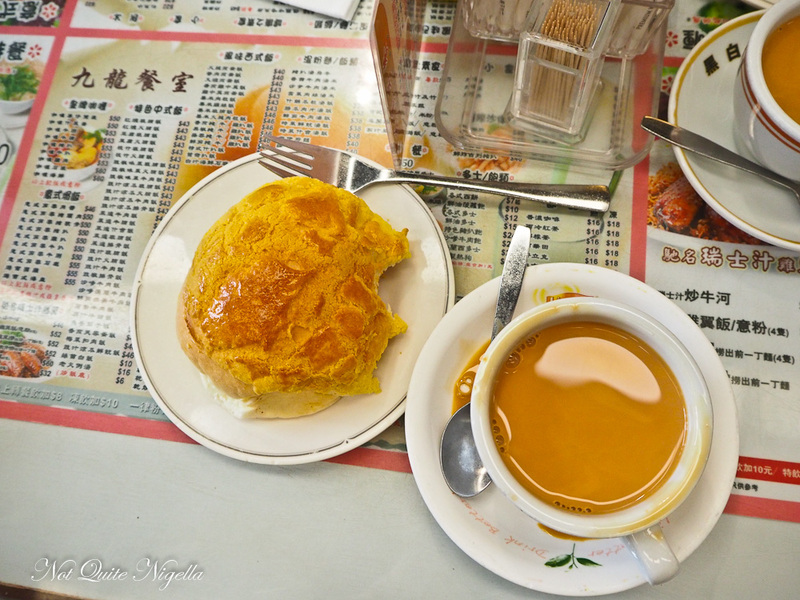 With plenty of food in our tummies, it's time to start walking the pineapple buns off with a stroll around the Sham Shui Po area. This walk goes for about 45 minutes to an hour and serves to invigorate our appetites as well as show us historical points. We pass by wet markets that do a busy trade. Even in the sticky heat everything looks fresh. Customers pick out frozen chicken wings, ducks feet and chickens feet with their hands. 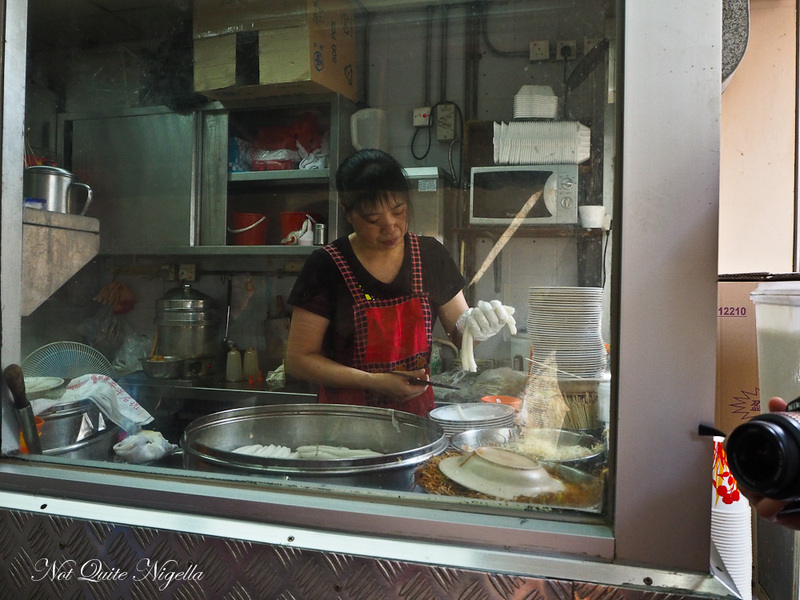 We stop by a noodle shop where they are busy stretching noodles, the noodle maker appearing from behind a cloud of flour dust. 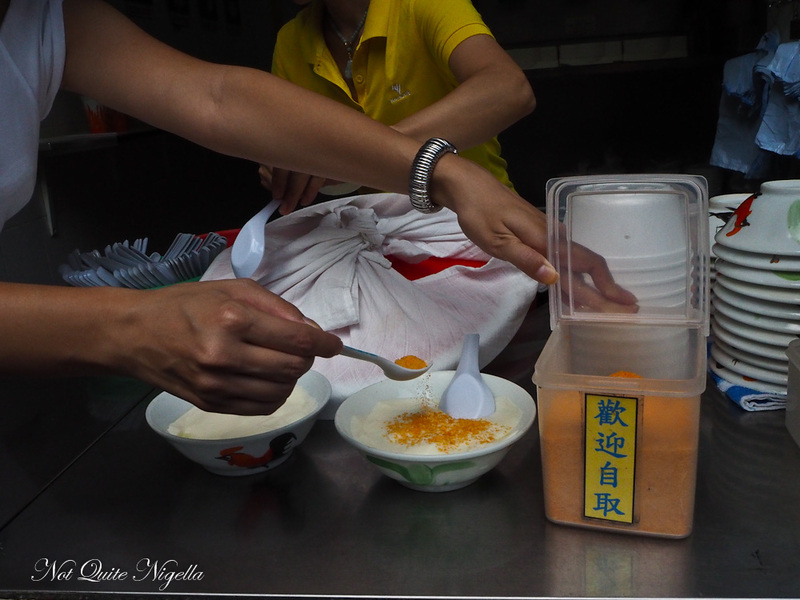 Popular noodles are the shrimp egg noodles that contain dried shrimp eggs to add flavour and sweetness. Dried seafood is a very popular item used as an ingredient for many dishes. There are also a range of pickles that range in flavour from sweet, salty and spicy. We walk through a haberdashery area where there are plenty of beads, ribbon and garment embellishments. In the 1940s after a mass post WWII migration from China, garment manufacturing became prominent in the area. Now it has mostly moved to China but some of the shops still remain. 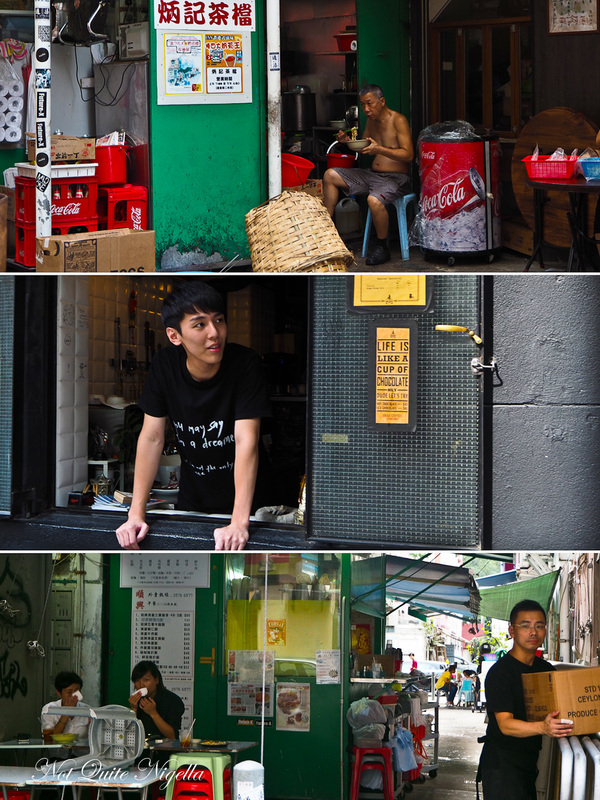 Our next food stop is t A1 tofu company, a small shopfront started three years ago by three entrepreneurs. They took one year off to learn the art of tofu making and this small shop is said to make the silkiest, smoothest tofu available. They use organic Canadian soybeans in their tofu and even though we visit at 11am, in the half hour they have been open they have already sold four enormous pots of tofu. 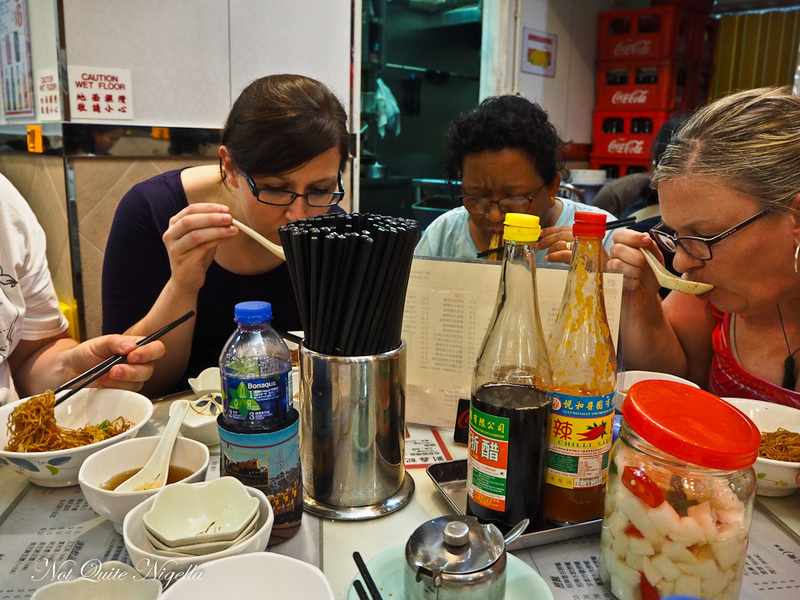 We try a bowl of the hot tofu and watch as they use a wide, thin spoon to scoop off thin layers of the tofu. You can add sugar, an orange rock sugar powder and a syrup - either ginger or regular sugar syrup. It's incredibly smooth and soothing to eat and although it is a substantial sized bowl, many manage to finish theirs. 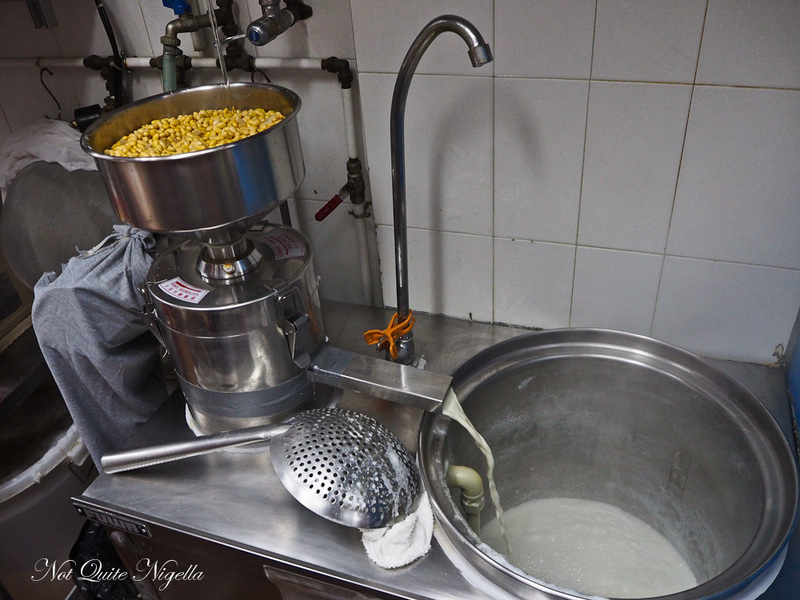 The soy milk is unsweetened and made through the same process albeit it remains unset. Our next stop is at Leung Tim choppers a well known kitchenware store that also has a branch in Sydney's Burwood. 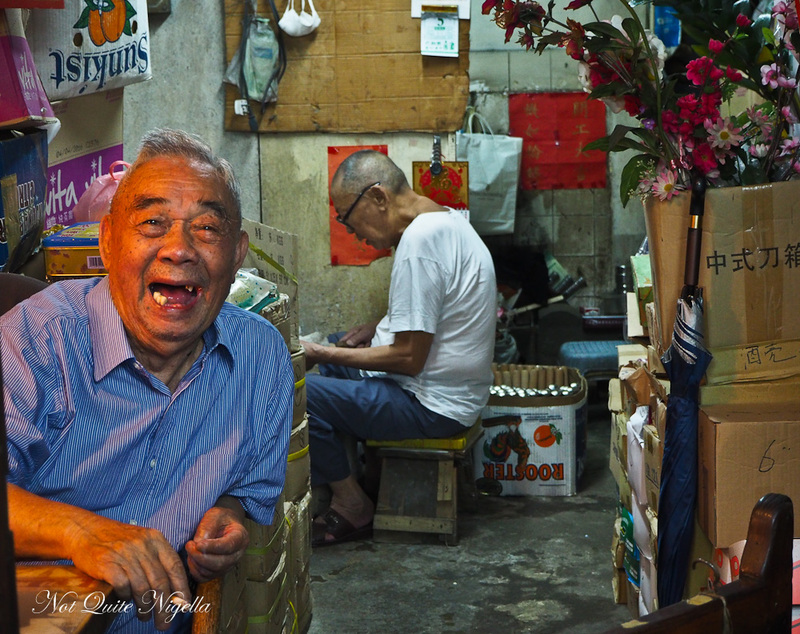 Mr Leung is over 80 years old and retired but he still sits in the back of his store and offers guests cigarettes. He learned the art of knife making in Sheffield, England and brought back the skills here. I buy some vintage enamel plates that remind me of plates growing up. Our fourth stop is at Lu Goose restaurant which is where they specialise in Chiu Chow goose, a regional style of goose braised in sauce. The goose is usually served sliced up and on the bone but they've removed the bones for us today. 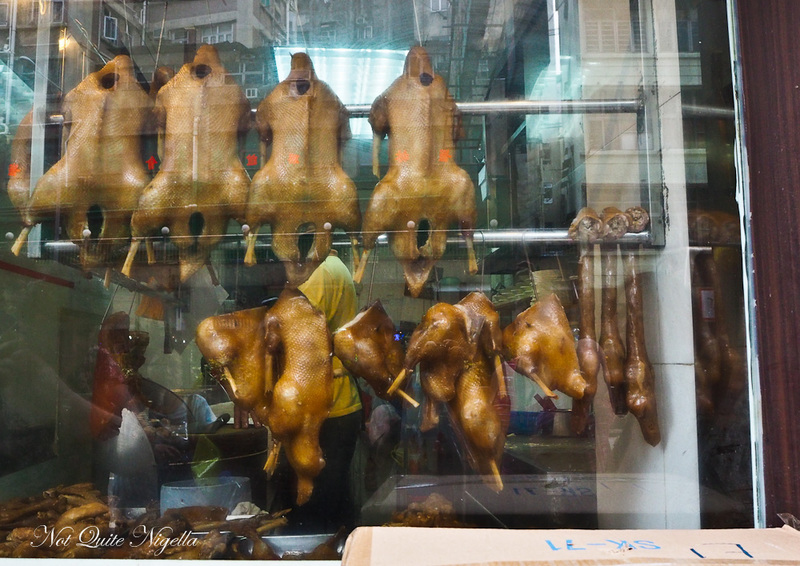 The goose is delicious-especially when dipped in the vinegar which really bring the goose to life (not literally ;) ) and it is served alongside pork knuckle fun tai, sliced with a edge of fat around it. The pork knuckle is simmered in Chinese spices. It's a popular place for lunch with construction workers. And how to tell a roast goose from a duck in the window? Look for the lump on top of the head - that's a goose! Crossing the mens's market (so named for the abundance of electronics on sale more than anything else), there is a slight change of plan. Instead of a sweet bakery for walnut cookies, as it is almost Moon Festival we stop by a bakery for moon cakes. The legend goes that moon cakes were born when Chinese wanted to overthrow the government. To communicate in secret, they agreed to send messages to each other only when the moon was the fullest and these missives would be concealed within small cakes. They do a fast trade at this shop as people stock up for the season-it's said to be reunion time as the shape of the moon as a circle signifies a return. Our last stop for today is just after noon and provides a more substantial meal. By now people are very full but it doesn't stop most of us from trying the noodles at Lau Sum Kee Noodle shop. Mr Lao started the business in the 1940s with noodle carts. We see his wife folding dumplings at a table in the front while he and his sons make the noodles at home. 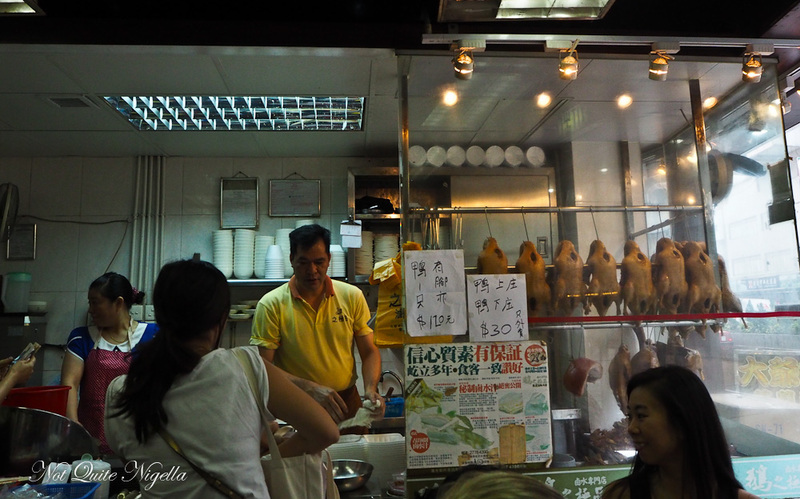 It is located on Fuk Wing Street which is also known as a foodies street where there are plenty of places to eat. 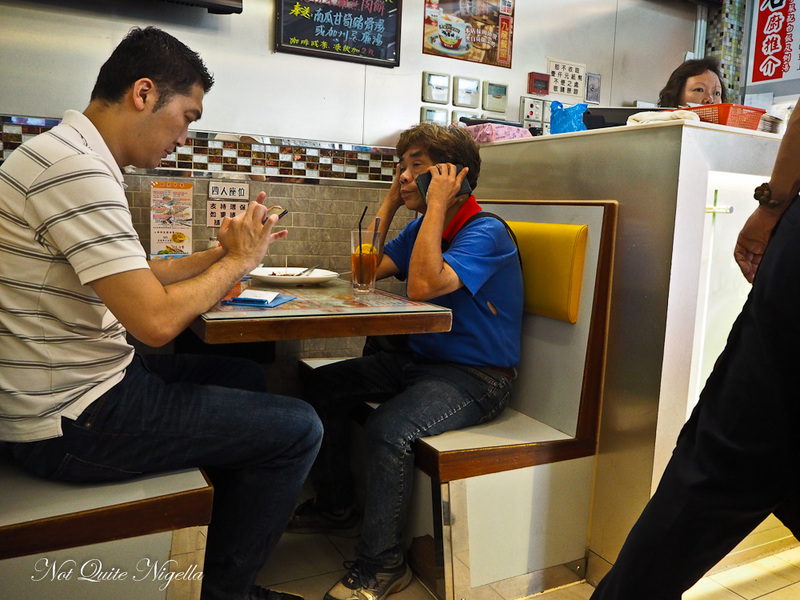 Hong Kong Foodie also provides a pamphlet with additional recommendations in the Sham Shui Po area as well as a list of useful Cantonese phrases. 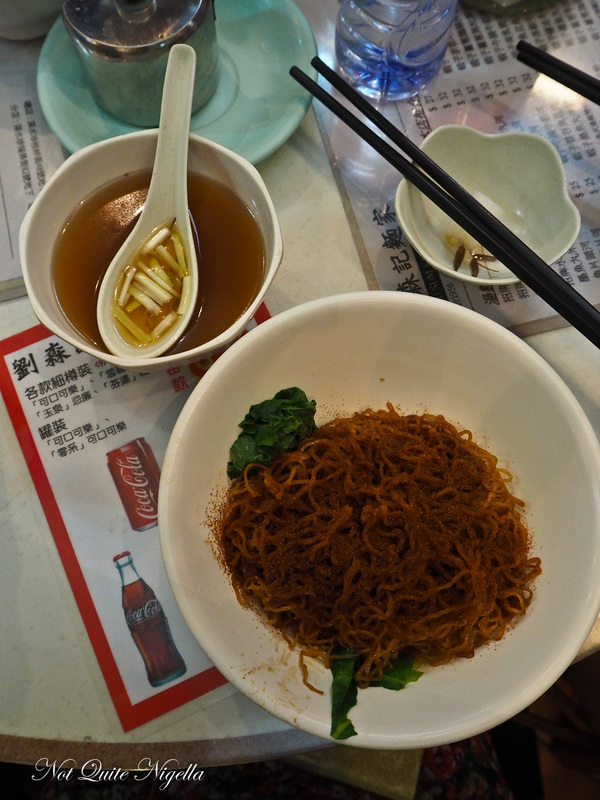 The shrimp egg noodles are served dry and al dente with a bowl of soup on the side. On top is a fine shrimp powder that adds a lot of flavour. You can also add chilli oil but a word of warning-it is very hot indeed. The revelation for me however is the soup with its sustaining sweetness, it is invigorating in this heat. 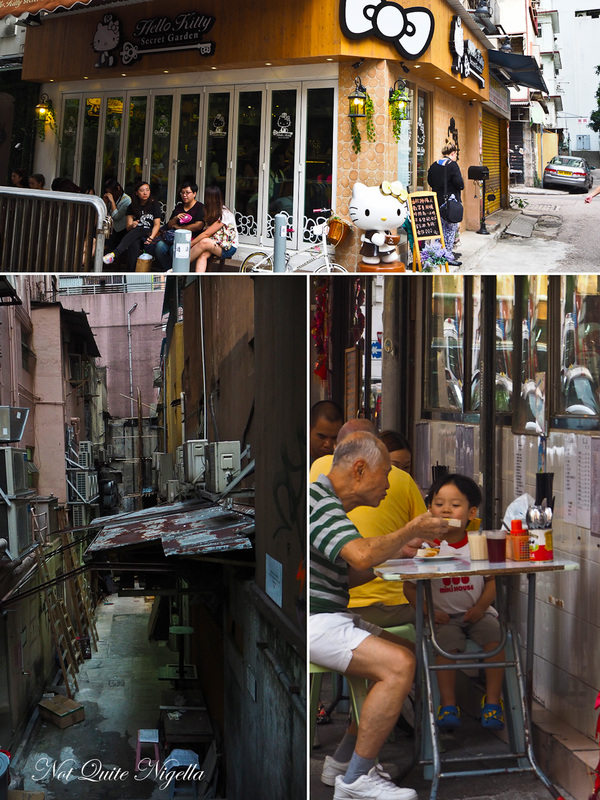 Another neighbourhood is the Tai Hang area in the south east of Causeway Bay. On the day that we visit it is the eve of the fire dragon festival. 200,000 people will crowd into this mostly residential neighbourhood each night over the course of three nights to watch one of the two places in Hong Kong where they have a fire dragon made of grass with incense candles dancing along the street. 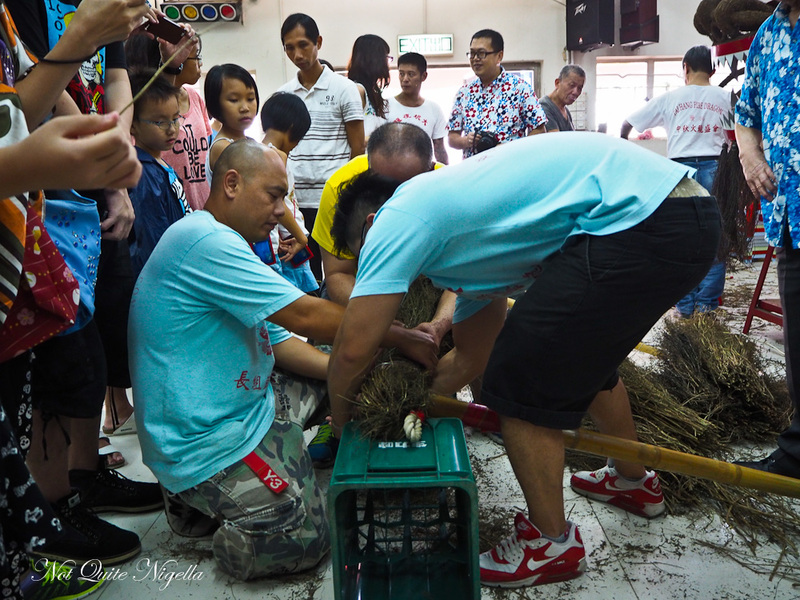 The tradition started in 1880 where it was a small Hakka village. 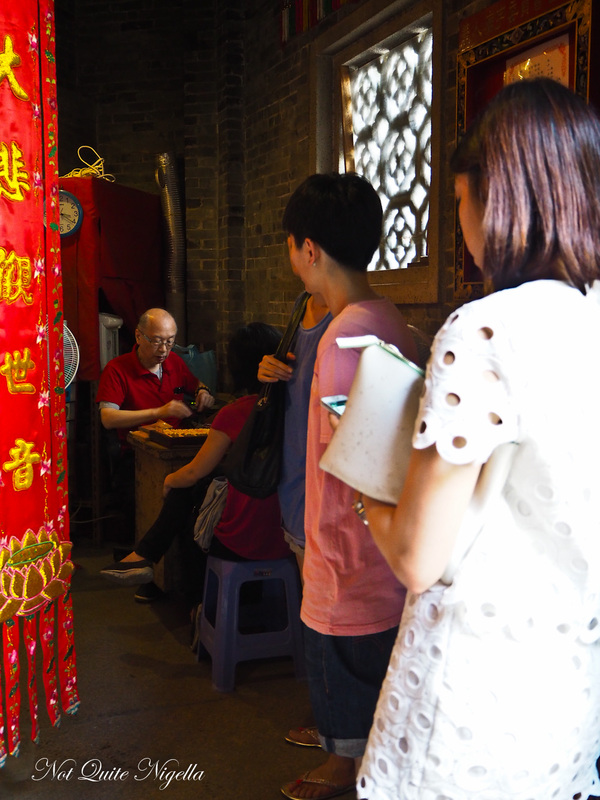 Mr. Fai, the chief commander of the Tai Hang Fire Dragon has directed the festival for more than 30 years. His father was the commander in chief before him and he grew up in the area. It is a shame that by the time the festival will be in full flight, we will have left Hong Kong for the shores of China as the excitement in the neighbourhood is palpable. 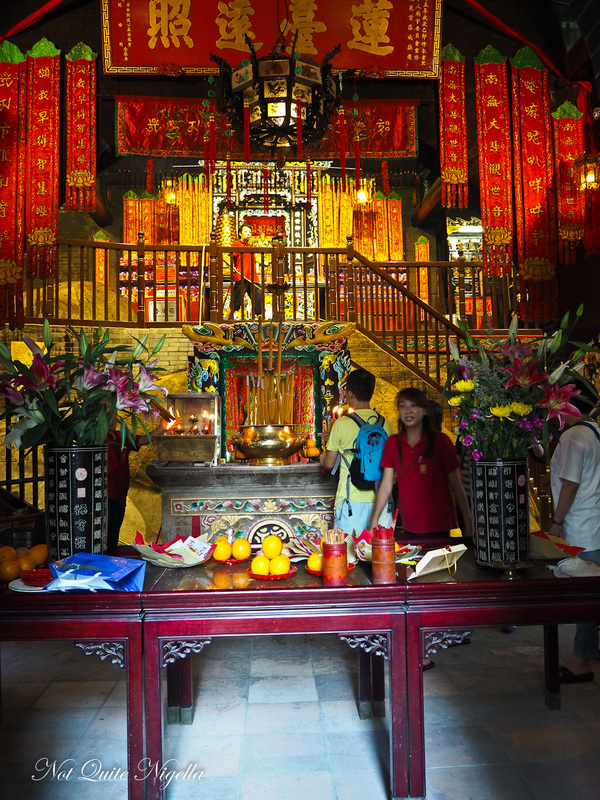 We then visit Lin Fa Temple built in 1946 where people worship Kwun Yum the goddess of mercy where a line of people are shaking Cim sticks. These flat sticks are held in a long bamboo cup help offer advice on life decisions and the stick that protrudes out corresponds to a written oracle. People then line up to receive the advice. Around this area is also a cluster of dessert and sweet shops as well as small, outdoor, local restaurants. On this Saturday afternoon queues form outside "The Pudding Nouveau" while the "Hello Kitty Cafe" has a long waiting line of people wanting apple shaped cakes and cakes topped with edible Hello Kittys. 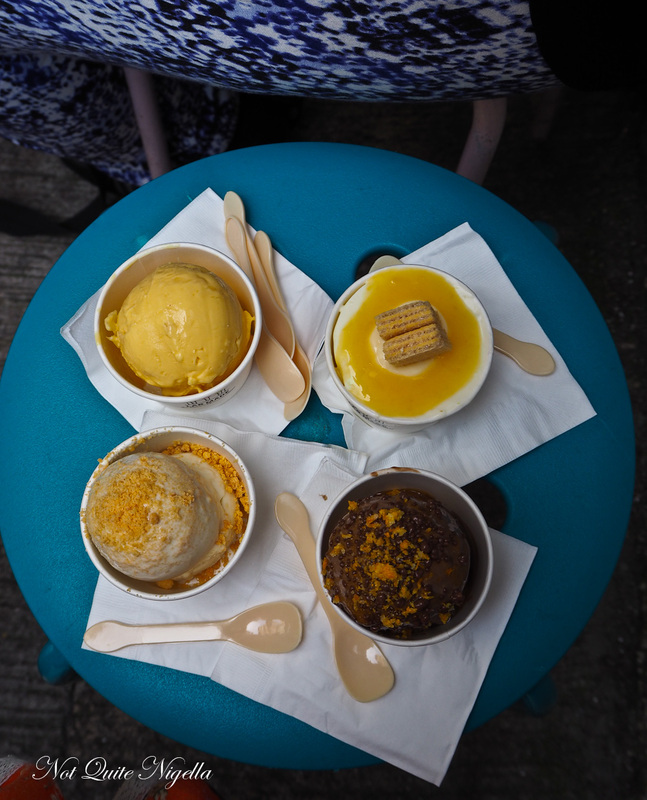 Lab Made is Hong Long's first nitrogen ice cream shop and does a fast trade of hand churned ice cream cooled down rapidly to -196℃ resulting in a smoother gelato. There are just four flavours to choose from today and the most interesting is the Moon Cake, particularly given the season. 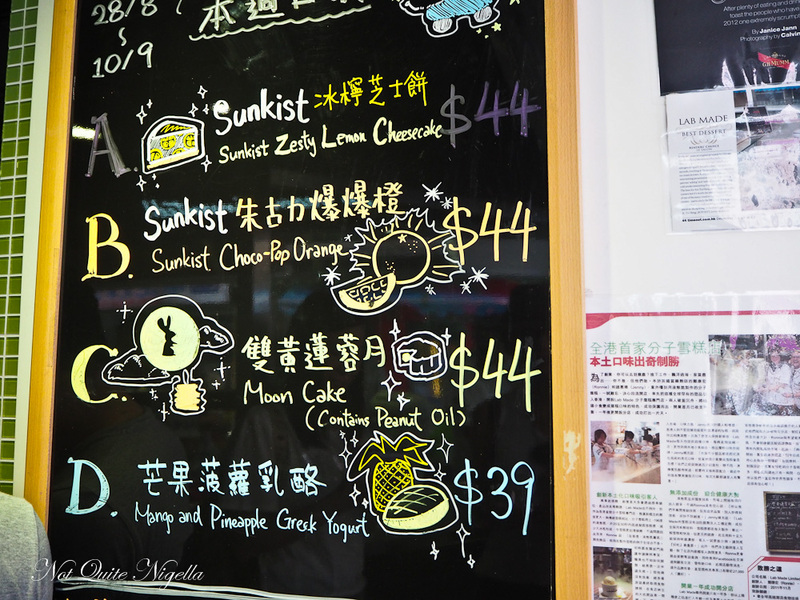 They all taste of authentic flavours and it's a toss up between the lemon cheesecake or the mango pineapple Greek yogurt but the Moon cake charms with its authenticity. So tell me Dear Reader, have you ever tried nitrogen gelato and if so, what do you think of it? And what do you think of Moon Cakes? 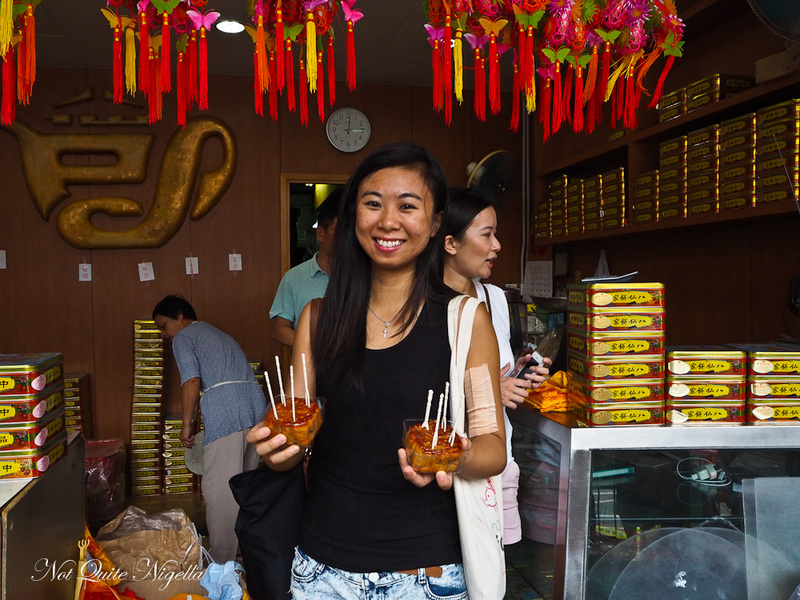 travelThe Unique Food of Macau and 10 Of Macau's Absolute Must Eats! 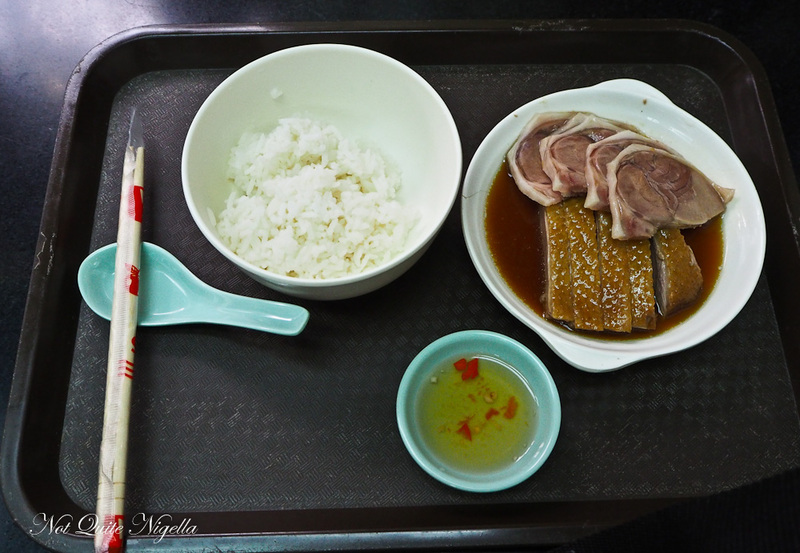 travel The Unique Food of Macau and 10 Of Macau's Absolute Must Eats!